I've wondered if dentistry will be needed during the millenium or in Heaven. I'd like to make the argument that 'yes' and this is why. If all living things were created spiritually before being created physically, then I would think that bacteria are included in that group, since they are living cells. Now...the cause of mostly all dental problems (caries, gingivitis, periodontitis, bad breath, etc.) are bacterial problems. Bacteria in your mouth and on your teeth feed on carbohydrates and excrete acid as a byproduct. Essentially...bacteria "poop" is acid. It is this acid that dissolves away enamel and causes cavities, it is this bacteria that irritates your gums and causes bad breath. Bacteria do not feed on proteins nor fats...so...being that during the millenium and in Heaven we won't be killing animals for food (nor will other animals be killing each other for food) we will only be eating plants, fruits, nuts, berries, etc, like in the Garden of Eden. So with a mostly carbohydrate diet, wouldn't that create a great need for dentistry during that time? Then again, our bodies will be close to perfect during the millenium and perfect in Heaven so that probably means having a perfect immune system and the bacteria in our mouths will probably be sent elsewhere to live due to the fact that they won't be able to live in our mouths and bodies. But still...it's wishful thinking that I will still be of some professional use after the 2nd coming. Or will priesthood power take that place of all medical professions? Probably. 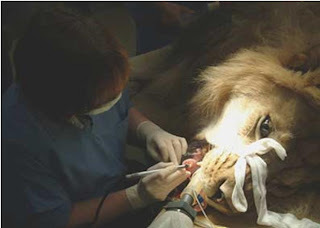 Animals can't even brush their own teeth, so someone will have to take care of them at least, right? Okay, So I'm finally getting around to post these pics of Halloween. Tommy looked SWEET!! 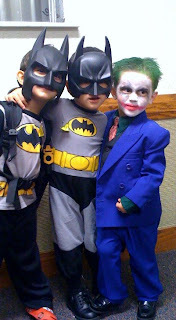 He was so psyched about dressing up like the joker. He was kind of half Jack, half Heith. We were looking for something at a thrift store and saw this purple suit, exactly his size...I was blown away!! So that made his costume idea easy. He won best costume. All the teenagers in our ward kept coming up to me in awe saying how sweet they thought his costume was...it was a fun night in the midst of a lot of sadness for our small family...which I'll share another time. I was born and raised in Manteca, CA and Melisa is from Santiago, Chile. We have been married since 2003. As newlyweds, we were so happy together but soon felt that we needed to be something more than just a couple...we needed to be a family. 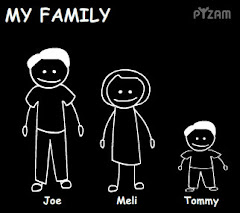 Tommy was born in May of 2005 and has been the life of our family ever since. He brings us so much joy and has helped us realize that families are the most important thing that we have on this earth. I graduated from BYU in 2006 and got accepted into the NSU college of Dental Medicine in Ft. Lauderdale. I'm now halfway done with my 2nd year...so still 2.5 more years of studies to go. We enjoy the sun here, but not the humidity and the lizards everywhere but at least we're happy and anxious to be done with these difficult years of Dental School.